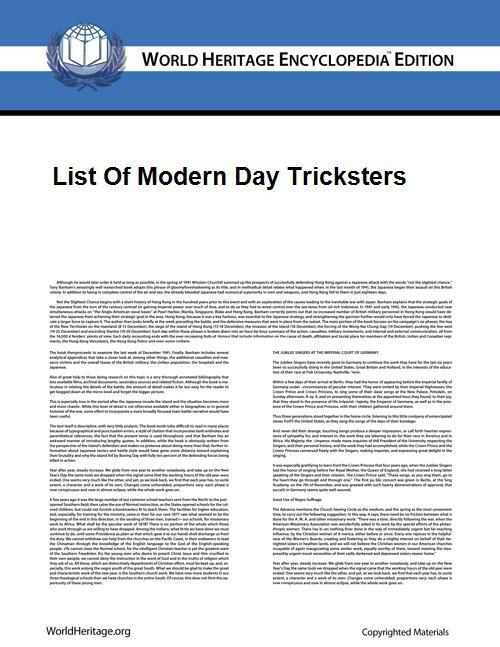 This list of tricksters attests to both the enduring nature of the mythological figure of the trickster and its continued popularity in a variety of media. The trickster, in later folklore or modern popular culture, is a clever, mischievous person or creature, who achieves his or her ends through the use of trickery. A trickster may trick others simply for their amusement, they could be a physically weak character trying to survive in a dangerous world, or they could even be a personification of the chaos that the world needs to function. An archetypical example is of a fairy tale of the King who puts suitors for his daughter to the test. No brave and valiant prince or knight succeeds, until a simple peasant arrives. Aided only by his natural wit, he evades danger and triumphs over monsters and villains without fighting. Thus the most unlikely candidate passes the trials and receives the prize. Such characters are a staple of animated cartoons, in particular those used and developed by Tex Avery et al. during the Golden Age of American animation. Br'er Rabbit - a slave trickster of African American origin. Coyote in various native North American mythologies. Curupira - a Brazilian folklore (male) jungle genie that protects the animals and the trees of the forests. It has red hair and backwards feet to confuse hunters and lumberjacks. Dionysus - Greek God of wine, madness, and ecstasy. More than any other Greek God, he is associated with shape-shifting and taking on other identities (which is part of why is also associated with actors). A thoroughly ambiguous person, in personality, but also in his androgynous figure, you never know exactly what he will do next. Eris - Greek Goddess of chaos in Greek mythology. Eshu/Eleggua/Legba - one of the primary orishas in Yorùbá religion, patron of roads (especially crossroads), doors, and travelers, as well as a spirit of chaos and trickery. Hermes - messenger of the gods in Greek mythology (or Mercury in Roman mythology), inventor of fire, and patron of travelers, boundaries and thieves. Jack - (best known from the story Jack and the Beanstalk) is a young boy who uses his wit to outsmart characters in many stories. Jack Mary Ann - a folk hero from the Wrexham area of north Wales whose fictionalised exploits continue to circulate in local folklore. John the Conqueror - character who appears in many stories from the African American tradition. He is a slave that is so much smarter than any slave-master, he simply cannot be controlled. Kuma Lisa - a fox and trickster figure in Bulgarian folklore. Kyprioth the Trickster - a character first mentioned in the Song of the Lioness quartet by Tamora Pierce and is a main character in the Daughter of the Lioness duo by the same author. He is head god of the Raka of the Copper Isles and has a direct tie to George Cooper and Aly. He is the god of thieves and tricksters. Loki - a shape-shifting, troublesome god in Norse mythology. Māui - a Polynesian culture hero famous for his exploits and his trickery. Pan - god of shepherds and flocks. He is a satyr: a creature that has the upper body of a man and the legs of a goat. In many stories, they talk of Pan, or just satyrs in general are known to play tricks on people, especially children, for their amusement. Puck/Robin Goodfellow - from Shakespeare's A Midsummer Night's Dream, plays tricks on a group of humans who stumble into a forest. His final monologue explains the nature of tricksters. Puss in Boots - a magical cat who tricks a king into raising a low born miller to the station of a great noble. Reynard - a red fox and trickster figure who plays a central role in the moralistic fables of the Reynard cycle. Saci - a Brazilian folklore character, a one-legged black or mulatto youngster with holes in the palms of his hands, who smokes a pipe and wears a magical red cap. Satan - In some interpretations of Christianity, Satan could be seen as the ultimate trickster whose role is to corrupt humanity. Satan was sometimes depicted as a trickster in English miracle plays. Susanoo - Amaterasu's brother, Trickster of Japanese mythology. Aang - The hero of Avatar: The Last Airbender enjoys tricking and playing jokes on his foes. Most of the Fire Nation thinks this of him as a child. Bart Simpson - from the animated TV series The Simpsons. Bugs Bunny - a rabbit trickster, in some respects similar to Brer Rabbit. Discord - an antagonist of Season Two of My Little Pony: Friendship Is Magic, and a protagonist in Season 3. He is a chimera-like creature known as a "Draconequus" and the spirit of disharmony in the world of Equestria. El-ahrairah - the Prince of Rabbits, or the "Prince with the Thousand Enemies"; the trickster folk hero of the rabbits in Watership Down. Felix the Cat - a "transgressor of boundaries" (in the most literal sense). The Great Gazoo - A resident of the planet Zetox, Gazoo arrived in Bedrock to annoy Fred and Barney in The Flintstones. The Great Milenko - a character in the Insane Clown Posse's joker's cards series who performs illusions on individuals. His role is to tempt individuals into performing evil acts by showing them illusions. These can be the mental way we block the truth of our actions or specific lies that convince us to take improper action. Then, right before he kills the person, he shows them the complete truth of how evil they have been. Harvey the pooka, a large anthropomorphic rabbit who can be seen only by the protagonist, from the play and film bearing his name. Impossible Man - an amoral, childlike, shapeshifting extraterrestrial from the Fantastic Four comics. Jack Sparrow - A notorious pirate captain from Walt Disney's Pirates of the Caribbean film series. Sparrow uses wit and deceit to attain his goals, preferring to end disputes verbally instead of by force. Jareth - King of the Goblins from Jim Henson's Labyrinth, who changes forms and uses magic to cajole the story's heroine through a series of puzzles. Joseph Joestar - Protagonist of Jojo's Bizarre Adventure Part 2: Battle Tendency. He defeats most of his opponents through clever tactics and tricks. The Joker - The chaotic counterpart to Batmans strive for order displays several characteristics of the trickster. Inscrutable, unpredictable and a defining obsession with gags and pranks that are sometimes harmless, sometimes deadly. The Mask - wears a mask imbued with Loki's powers and lack of inhibition. Mister Mxyzptlk - an imp from the fifth dimension featured in the Superman comics. Peeves - a troublemaking poltergeist in J.K. Rowling's Harry Potter series who haunts the halls of Hogwarts School of Witchcraft and Wizardry. The Pink Panther - a character featured at the start of the film and the animated series of the same name. Q and fellow members of the Q Continuum - from the TV series Star Trek. Sam - the main character of Roger Zelazny's novel Lord of Light, he created Buddhism on the colony world to oppose the dictatorship of impersonators of Hindu gods who ruled the planet. The Doctor- the title character of Doctor Who. Certain (if not all) incarnations of the Doctor can be seen as tricksters, particularly the second, fourth and seventh Doctors. The Trickster - the main antagonist of Thief: The Dark Project, he masquerades as an eccentric noble named Constantine, and apparently has the ability to shapeshift. His disguise serves to trick Garrett into giving him a powerful artifact that will return the world to a wild state. The Trickster (Gabriel)- an antagonist of Seasons Two and Three of Supernatural, who often plays tricks on Sam and Dean. In Season Five, it is revealed that he is the archangel Gabriel who came to Earth to get away from the fighting between his angelic brothers in Heaven, and that he took on the name of Loki and masqueraded as a pagan god once on earth. Wile E. Coyote - featured in the Road Runner cartoons and based on a traditional Native American trickster figure, Old Man Coyote. An argument might also be made that Wile E. Coyote's nemesis, the Road Runner itself, is also at least as great a trickster as Wile E. himself. Woody Woodpecker - "A less complex version of the Trickster." Puck from Gargoyles - The Faerie trickster from A Midsummer Night's Dream, he plays a major role in the Disney animated Television show "Gargoyles (TV series)"
Beetlejuice - from the Tim Burton Movie, he is a Poltergeist from the Underworld, who can change shape and make things appear out of nothing. He is obnoxious and devious and is a perfect example of a trickster. Clopin- King of the Gypsies and Master of Ceremonies at the Festival of Fools, from the Disney Film The Hunchback of Notre Dame, he is a brightly clothed jester who is devious and has a dark humor. Loki (comics)-from the Marvel comic series, and from the new marvel movies Thor and Avengers. He is based directly off of the trickster god Loki from Scandinavian mythology. Bartimaeus- A cheeky djinni, and the main character of the book series by Jonathan Stroud The Bartimaeus Sequence. He is a shape-shifter, and a humorous and arrogant character with a high intelligence.